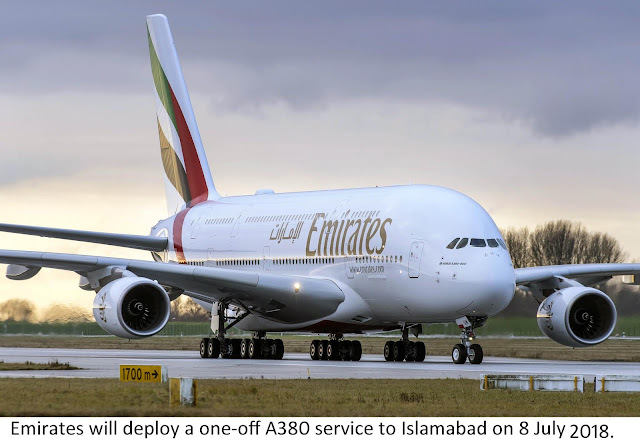 Emirates, the world’s largest international airline, announced today that it will deploy a one-off A380 service to Islamabad on 8 July 2018. The airline’s iconic double-decker will make its inaugural arrival in Islamabad on a special flight EK2524/EK2525. The A380 flight will depart Dubai on 8 July 2018 at 0800hrs and arrive in Islamabad at 1210hrs. The flight will depart Islamabad at 1540hrs arriving in Dubai at 1745hrs on the same day. “We are proud to bring our flagship A380 aircraft to Islamabad, and we look forward to showcasing our innovative products on-board this iconic aircraft with the signature Emirates service. While this is a special flight, we are very keen to launch a scheduled A380 service to Pakistan and will continue to work with authorities to realise these plans,” said Sheikh Majid Al Mualla, Divisional Senior Vice President Commercial Operations Centre, Emirates. The Emirates A380 aircraft on this special one-off service will be in a two-class configuration offering spacious seats in Economy Class and fully flat-bed seats in Business Class as well as Emirates’ popular Onboard Lounge. Passengers in all classes enjoy free Wi-Fi to stay in touch with family and friends and Emirates’ multi-award winning ‘ice’ inflight entertainment with up to 3,500 channels of movies, TV programmes, music and podcasts on the industry’s biggest personal screens in each class of travel. Emirates and Pakistan have a shared history tracing back over 30 years when the airline’s flight landed in Karachi on 25 October 1985. In the last three decades, Emirates has progressively expanded its operations and offering global connectivity and world-class services to Pakistan’s major cities including Karachi, Lahore, Islamabad, Peshawar, Sialkot and Multan. Emirates Skywards, the award-winning loyalty programme, offers its more than 400,000 Pakistani members’ exclusive privileges, including earning Skywards Miles when they fly on Emirates or partner airlines, or when they use the programme’s designated hotels, car rentals, financial, leisure and lifestyle partners. Emirates currently has 104 A380s in service and 58 pending delivery, more than any airline globally. The airline also recently announced a US$ 16 billion (AED 58.7 billion) deal for 36 additional Airbus A380 aircraft.